Disclaimer Entertainment Technology Asia is published 12 times a year. All rights reserved. No part of this magazine is to be reproduced, whether mechanical or electronic without the prior written consent of the publisher. Views expressed in this magazine do not necessarily reflect those of the editor or the publisher. Unsolicited contributions are welcome but the editor reserves the discretion to use them. Whilst every care is taken to ensure the accuracy and honesty in both editorial and advertising content at press time, the publisher will not be liable for any inaccuracies. JOIN US IF YOU ARE QUALIFIED AGENTS/ DISTRIBUTORS IN YOUR AREA! Thailand is on the right path to upgrade occupational skills in the entertainment technology industry. Taking the lead are veterans from the sound, light, visual and acoustic sectors of the live entertainment segment. Witnessing the growth and expansion over the past 4 decades of the entertainment industry in Thailand and recognising that the industry needs the required skillsets to keep pace is what motivated the industry to come up with a comprehensive plan. With only a handful of local universities offering degrees related to the entertainment industry, interested individuals find it hard to get a good job in the industry due to poor or no foundation training. The flow of poorly trained workers has many companies scrambling to find ways to expand their business, which has resulted in companies conducting in-house training to all staff and dealers to advance themselves, where there is no real standardisation of skills. TPQI is a member of the global TVET (Technical and Vocational Education and Training) movement launched and supported by UNESCO-UNEVOC back in 1992. TPQI mission is to certify professional knowledge, expertise and skills by determining the level of personal competencies using standardized classification of personal competencies to promote national competitiveness. This process of trying to promote professional qualification as a means to job placement and career advancement aims to help people excel in respective industries. This would help bridge the importance between knowledge and competency for a more holistic professional advancement and ensure that the industry as a whole has more qualified personnel joining the ranks. This TVET movement not only helps establish a pool of skilled workers for the industry but it does contribute to the bottom line of unclassified and unemployment figures too, as it reaches out to all 77 provinces in Thailand, where proper education, training and even certification is not a given. In addition, as the leader among the Cambodia-LaosMyanmar-Vietnam region, the formalization of skills and certification of TVET vocational training, would help spearhead Thailand as the entertainment and training hub for this region. The initial sectors within the entertainment industry urgently needed were sound reinforcement, live stage lighting, live imaging projection and acoustic design for music venue. Since these sectors employed the most people across all 77 provinces, be it mini concerts in shopping malls to temple shows to big local & international concerts. The process started with the gathering of leading industry veterans and top Thais companies in the sound, light, visual & rental business to gather for the very first time to share experiences and expectation for the development of new professional occupation standard. The initial phase saw the formation of the skillsets needed for Sound and Lights for live events, club, theatre and MICE industry. Professionals from the local industry were invited to join the various workshops to share about the various skills in demand within these industries. Their main task was then to help draft the skillset required for each job and then further divide them into various skills level. The team met on a weekly basis to brainstorm on the formation and formalisation of the first occupational standard for the Thai entertainment industry. Working group presenting the skill framework for each sector of sound, lights, image and acoustic. SINGAPORE: Yale-NUS College has the distinction of being the very first liberal arts college in Singapore. The college was established in 2011 as a collaboration between Yale University from USA and the National University of Singapore. Located within University Town in central Singapore, the college features three performance spaces, namely the Performance Hall, Blackbox Theatre and the Amphitheatre. The Performance Hall has a total seating capacity of 339 between its Stall and Circle seats and is used for acoustic performances, talks, seminars, concerts and even doubles up as a lecture theatre when needed. The Blackbox Theatre has 126 retractable bleachers with a maximum capacity of 152 seats and is used for theatre performances as well as talks, seminars, concerts and classroom lecture. The outdoor Amphitheatre is designed as a 3-tier semicircular seating space and does not have an overhead protection from the weather. It is mainly used for small gigs and as a hangout space. strong yearnings for his family and his passionate artistic essence. Displayed on two canvases illuminated by five Christie E Series 1DLP® projectors, the exhibition is sponsored by Christie Korea with the projectors installed by valued partner IMTEC, which was responsible for several outstanding digital art and performance projects in Korea, such as the ground-breaking ‘Deoksugung Project’ exhibition in 2012 and ‘The Magic Flute’ opera performance in 2015. Both events used Christie visual solutions. Four edge-blended E Series projectors light up the 16-meter wide by 3-meter high first canvas featuring the artist’s experimental paintings on the metal foil linings of cigarette packs. Thanks to Christie’s high definition display technology, the original 15cm by 9cm paintings are bringing out the beauty of these small silver foil drawings. Achieve high-precision images and unparalleled color reproduction with super-quiet operation for your presentations and displays. Christie® HS Series offers the brightest 1DLP® laser phosphor projectors with Christie BoldColor Technology, boasting up to 13,500 lumens in WUXGA and HD resolutions. Backed by industry-leading warranties and service, you can be confident in your investment. PT HESED Kharis Appointed Exclusive Distributor For Indonesia By Cadac INDONESIA: Cadac announced the appointment of PT HESED Kharis as exclusive distributor for Indonesia. HESED is a leading distributor and system integrator in the territory, and adds Cadac, as its exclusive mixing console brand, to a portfolio that includes the likes of TWAUDiO, Powersoft and Lab Gruppen. VIETNAM: Proel's newly appointed distributor Viet Thai An Trading Co. Ltd. organised a product seminar and demonstration of Axiom professional loudspeaker products in the Vietnamese capital Hanoi in March. Technical sales support engineer Daniele Massaccesi, in a format that has proved successful in opening new markets to the Axiom brand, introduced the company's 25 year history in manufacturing, and the solutions offered by Axiom loudspeaker systems. The first day was largely devoted to training of the internal sales and technical support staff, introducing them to an overview of the products in the Axiom range and their applications. The second day's proceedings provided a more detailed presentation of the entire Axiom product catalogue – medium and small scale line arrays, point source loudspeakers, subwoofers, and supporting electronics – and how they may be best used to create solutions for many everyday problems encountered in mobile and permanently installed sound reinforcement situations. In particular, two relevant topics were discussed: subwoofer array beam forming, and examples of how to use front fill speakers to augment a main PA system. Projection Mapping onto the two trees at the venue. SINGAPORE: Barco held its by invitation only event on 1st June at the open rooftop level of OUE Bayfront. Thankfully the rain had let up on time and it provided a cool evening for guests to mingle and get information about Barco's latest product releases. In a separate room within the venue, Barco showcased its latest ClickShare solution and more interestingly the Junior edition from its Event Master family â&#x20AC;&#x201C; the E2 Jr and S3-4K Jr thus enabling smaller companies to benefit from Barco's renowned technology, advanced features and 4K performance at an attractive price point. The ClickShare solutions on showcase were the CS-100 targeted for 1 user on-screen that enables sharing from a smartphone, tablet or laptop and the CSE-200 for up to 2 users on-screen, mainly targeted at smaller meeting rooms or even huddle-room space. CHINA: The Media Networking Alliance (MNA) – the professional AV industry alliance established to promote awareness and uptake of AES67 – has announced the membership of two major Chinese audio technology companies. 3G Audio and Ningbo Soundking Electronics & Sound Company are the first mainland China based companies to join the MNA through the offices of Sam Zhao, newly appointed MNA Representative, Greater China. System Application Engineer, Greater China with QSC Asia, Sam is a graduate in Electronic Engineering of the Beijing Broadcasting Institute. He has focused on developing applications of AV networking technologies from the earliest days of CobraNet, including as Chief of Technology Training Section at the Technology Management Center, at China Radio International. He has written extensive technical papers in China on the subject. In the past 15 years Sam has trained more than 6000 people in the field of DSP and network transmission solutions throughout Greater China, and has worked on a number of high level network application projects for airports, theme parks and convention centers. He joined QSC in 2013, relocating to Hong Kong. The MNA appointed Sam in May this year as its representative in Greater China, to promote AES67 development in the region. B&C Appoints New Regional Sales Manager For APAC/EMEA Region APAC: B&C Speakers has appointed Gianluca Dalessandro as Regional Sales Manager for the APAC/EMEA Region. If you are a Zero88 console user, you will find useful video tips from Lighting Controls, who are the distributors in Singapore for the brand. Currently there are four short videos touching on copying scenes, editing scenes, inserting scenes and how to record submasters. Hexogon Solution Pte Ltd was appointed by Walt Disney Company to light up Marina Bay Sands Singapore for the launch of Marvel’s Captain America: Civil War. Hexogon Solution deployed a total of 39 units of high lumens projectors, that comprised of 27 units 20,000 lumens projectors and 12 units of the latest state-of-the-art 4K resolution digital projectors for this astounding 6-minute spectacular. Prolyte's Verto truss is a new revolutionary system, making truss connection fast, silent and safe. The Verto truss brings a totally new perspective on truss assembly and is described as a game changer in our industry. Check out the video and see how the Verto is going to revolutionise your truss assembling and de-assembling. Let Lighting Designer Chris Moylan bring you through the steps of using your dot2 more effectively. MA Lighting's dot2 has been gaining momentum since its launch and these tutorials are the perfect complement once you have purchased your dot2 console. Barco Introduces Two New Juniors Catering to companies who are pining to have the Event Master in their inventory but yet not needing the full feature for the moment, Barco has given them a way in with the introduction of two new juniors within their Event Master family of screen management systems. The E2 Jr and S3-4K Jr allow smaller companies to benefit from Barco's renowned technology, advanced features, and 4K performance at an attractive price point. Moreover, they always have the opportunity to upgrade to a full-blown E2 or S3-4K system at any time. This way their Event Master system grows with their shows. The E2 Jr and S3-4K Jr enable easy and reliable show setup and production at 4K performance level and are futureproof as they provide an option to upgrade to the full E2 and S3-4K systems. Offering 16 inputs, 8 outputs, and 8 mixers, the E2 Jr features the same 4 RU form factor as its bigger E2 brother. The S3-4K Jr comes with 8 inputs, 4 outputs, and 2 mixers in the same 3 RU form factor as its bigger S3-4K brother. Ashly Launches digiMIX24 Digital Mixer The Ashly digiMIX24 features 24 inputs (including 16 Class-A mic/line inputs); up to 14 mix buses (configurable in many useful ways); 8 Aux outputs, 8 channel inserts; 33 channels of dynamics and equalization processing; and 2 stereo effects processors with reverb, delay, chorus and more. Its intuitive control surface pairs with a seven-inch LCD colour touchscreen, intelligent metering, and motorized faders. The system management software makes it easy to save, load, or copy mixer setups. Optional, field-installable cards provide either Dante™ connectivity or a USB interface for easy multi-track recording or playback. Ashly's digiMIX24 is a versatile, compact 24-channel digital mixing console with professional inputs/outputs, integrated signal processing and effects, iPad® Remote Control integration, user-friendly software, and intuitive mixing via the live control surface. The Ashly digiMIX24 is ideal for worship and educational facilities, auditoriums, gymnasiums, performance spaces and project studios. AV Tech Tour A visit to a large integrated project that provides professional AV consultants a glimpse of the technicalities undergone to create a project, behind the scenes and various other activities. A 3 Day Conference where the Industry will gather to share cutting edge design and installation experience and insights into business opportunities along with intensive indepth presentations built on prestigious projects. Community Announces Compact I SERIES Community announces three I SERIES Compact models designed to match the performance, appearance and voicing of the larger I SERIES Point Source and Subwoofer models. I SERIES Compact loudspeakers are the perfect complement to Communityâ&#x20AC;&#x2122;s larger I SERIES 800-Level and 600-Level models for distributed applications, front-fill or side-fill or as the main loudspeakers in smaller spaces. All Compact I SERIES have best-in-class LF extension, sensitivity and maximum output, ensuring high quality sound reproduction. The 6.5-inch IC6-1062 features unprecedented LF extension for its cabinet size and a very wide dispersion 100 x 100 degree fabric dome HF on a shallow waveguide, providing a smooth response while retaining high sensitivity. The single 8-inch IC6-1082 and symmetrical dual 8-inch IC6-2082 are available with two rotatable horn patterns (120 x 60 degrees, 90 x 60 degrees) paired with low distortion, high output 1.7-inch diaphragm HF compression drivers. Compact I SERIES are available in textured black or white or in a custom colour as one of several Configure-to-Order (CTO) options. Ayrton Dazzles With Industry's First Dynamic LED Strobe Ayrton’s MagicBurst™ is the company’s first strobe unit, and the world’s only motorised strobe to offer continuous, unlimited rotation on its pan and tilt axes, which first burst onto the stage at Prolight + Sound 2016. MagicBurst’s 384 x 384 mm squared face supports 3,840 high-output white LEDs grouped into 64 pixels on an 8 x 8 matrix. With a new, state-ofthe-art, ultra-compact 1300W power supply, MagicBurst can deliver a peak light output of over 240,000 lumens – perfectly calibrated at 5600K - for several seconds, and put it into continuous rotation. Over the years, the team behind Indian company "Stonewater" has been responsible for award winning products and has become the preferred choice of installation sound for many premium global brands in the hospitality, entertainment and retail industry within India. Stonewater comes with a rich technical heritage of over 42 years of experience with cutting edge innovation in the field of electronics and electro-mechanics. A strong R&D is coupled with a global manufacturing base that spans between Europe, China and India. Andrew: Vikram, can you describe some key points of your business? Vikram: Drivers and other key technical components for our premium enclosures are manufactured in High Tech European, Japanese and American factories. The non technical parts like wooden enclosures, plastics, clamps etc are manufactured in India and China under strict quality control. Such a balanced spread of our manufacturing base, allows us to keep a tight handle on product cost while still delivering world class performance. The end result is that our customers do not need to pay more than they need to. machine-based objective testing, as well as the sensibilities of seasoned human experience in the engineering workflow. We bring you a Q&A between Andrew Richardson of FaitalPRO and Vikram Shetty, Director of Stonewater Audio Labs. Andrew: Who are your target clients? Vikram: In the first phase, we are looking at high end bars and clubs as our primary targets. In phase two we will look at high end rental companies. Andrew: What is your view of the pro audio market in India currently? Vikram: I think the Pro-Audio market in India is gradually evolving from a purely brand conscious to a quality conscious market. This is good news for us. A few years ago, people would buy a product just because its a western brand. Now I see that is changing steadily. Customers are increasingly basing their purchase decision more on the quality of the product and less on the geographic origin of the brand. more than traders buying finished products from China, re-badging them and selling them in the Indian markets. Stonewater on the other hand, from the very beginning has laid a huge emphasis on high quality research. This has led to products that not only perform well, but also address some very specific and peculiar needs of the Indian market. A big part of the credit for nurturing this culture of innovation at Stonewater, goes to my business partner, chief designer and founder Mahendra Palesha, a technical genius who is always relentlessly looking at ways to better his last successful design, no matter how good that last design was. Andrew: How is the business atmosphere in your territory? Vikram: India is probably one of the world's most amazing and complex markets. High sensitivity to price and an extraordinary diversity in demographics are important factors to consider when one operates in the Indian markets. Just to give you an idea, we have over 1652 languages spoken in India. With that comes huge variations in culture and consumer behaviour too. One has to get the cost to quality ratio absolutely right. There is really not much room for error in this area. Like in any challenging environment, those that adapt the best tend to survive. Often times strategies that serve well in western markets yield very different results in India. Consider the case of Apple. In the US, the world's second largest Mobile Phone market, Apple enjoys an approximate 44 percent of market share. Whereas in India, the world's third largest mobile market, Apple has a measly 1 percent market share. This tells you an interesting story. western brands demanded for the same performance. When this was achieved, we felt it was time to expand into higher segments. So we decided to launch a new range of products that competed with top end brands in terms of performance, but would be priced in the range of Mid-level products from western brands. We have a really good in house engineering/R&D department. However, even the best R&D in the world cannot result in good products unless your component quality matches up. This is why we decided to look at European suppliers. Finally we decided to go with FaitalPRO for a combination of reasons. 1. They have one of the most modern and high tech manufacturing facilities in the world today. This results in a high degree of manufacturing consistency. 2. Most of their products sound really great. The compression drivers in my opinion are really musical. 3. A very responsive and cooperative sales team. This is a very important but often neglected factor by many companies. Andrew: Please share your comments on the "big picture" in relation to changing over to work together with FaitalPRO Vikram: Faital's capability to manufacture quality components when married to our strong in-house Research and Development strengths have led to the creation of some truly outstanding products. These products can easily compare with industry leading products in terms of performance. The fun part is, due to lower operating overheads of development and assembly in India, we can make them much more affordable to customers when compared to competing brands of foreign origin using similar quality components. Partnering with FaitalPRO has certainly increased the prices of our products. But what has not been damaged is the Quality to Cost Ratio. In fact I would even argue that there has been a net improvement in the quality to cost ratio, despite the increase in prices. Andrew: Any idea for future plans? So we will continue to experiment with additional models and products from the company and look for a good affordable 18 Inch sub-woofer with higher sensitivity than what's currently available. Andrew: What is the overall impression and comments from your clients since making the change over to FaitalPRO components in your design enclosures? Vikram: Great performance with great consistency at hard to believe prices! ALM EXPO 2016 – the 16th edition of India’s premiere tradeshow on Pro Audio, Live and Install Sound, and Light – sought to scale up by further remodelling from its previous editions, through some very specific initiatives on both quality and quantity. The result was visible across the show floor and booths that looked far more serious in business, with experientially less noise distraction, albeit a discordant note or two! •	The event had a separate hall - Hall 5 connected to Hall 1, that featured booths/exhibits focused on lighting effects, lasers, stage lighting, install lighting, lED displays, video projection. Hall 5 due to the nature of the exhibits did have audio playing out loudly though intermittently as after all how can you do a light show without music. In contrast Hall 1 that was dedicated for Audio, featured low, or NO sound ambience. The twin-factors of strict enforcement of ‘NO-Sound’ regulation on exhibitors, and ‘paid entrance only’ had a very reassuring impact on the event, according to most. The glare of criss-crossing lighting and laser beams having moved to a different hall also helped the business to a good extent, since it also took away the milling crowds that normally get in for the sheer fancy of colour hazes. •	Direct presence of two German audio majors, Adam Hall and beyerdynamic. •	New musical bands and products taking centre stage at the Arenas. •	A 3D-in-3D projection mapping display by the newly carved Modern Stage Services Private Limited. •	‘Made-in-India’ speakers from first timer Micro Electronics. •	Coming in of DPA microphones to Indian market. Using six units of Christie’s 14,000 lumen DLP projectors, aligned in with Infitec’s 3D solution, and Dataton’s latest Media Servers, the MSS Pvt Ltd team weaved magical designs on the show floor. Adam Hall, the German manufacturing and distribution conglomerate, having been at the event for many years through its local partners, chose to have its direct presence this year. The company marked its coming by highlighting its brand ranges that included Gravity microphone stands; analogue VIBZ mixer; Maui5, and Curv 500 LD systems. The company also displayed a range of stage systems and hardware solutions. the Vi7000 packages ultra-low noise mic amp designs and enhanced 96kHz 40-bit floating point digital audio processing, while FX comes courtesy of 8 independent Lexicon multi-FX units, BSS DPR901ii integration and a BSS graphic EQ on every bus output. Music Group exhibited a whole big range from across its brands, that were highlighted with their ‘technology innovation’ award winning iQ-15 portable loudspeaker, that comes with 2500 Watt power, Klark Teknik DSP technology, and Ultranet networking. Music Group demonstrated, besides the iQ Series, the iP Series from Turbosound, and those from its constituent brands. Sennheiser brought to show its latest HD headphones. The audio major also highlighted its popular Evolution Wireless D1 digital transmission system; the KH 805 active studio subwoofer, and the TLM 107 microphone, among others. Yamaha Music India, continuing its last year’s initiative of separate, and large show, outside the main hall, exhibited its ranges of mixing consoles, MI and PA systems. The highlights of the show included the MA2120 and PA2120 switchable Class-D mixer amplifiers, the PX series power amplifiers, and the Tio1608-D Dante-equipped I/O rack. Hamsika, in her mesmerizing best voice, enthralled the crowds with her renderings, independently, as well as, in the company of Kaushal S Inamdar – her partner in the now fancied Ras Yatra band. Crooning in different genres, and with variety of timbre, the Kashi girl who made waves with Chammak Challo and Chanda Re in Bollywood, took the audiences with rapturous applauds. Popular singer Mihir Joshi did the honours of introducing the Ras Yatra duo, and band to the Live Arena audiences. While the day one of the Live Arena began with Hamsika and Kaushal, rest of the programming included Sivamani, Ranjit Barot, Mihir Joshi, Clinton Cerejo, Kabir’s Cafe and Sunitha Sarathy. Prabath Enterprises relies on the Bosch EVF Series to attain the perfect coverage setup that would provide full sound coverage and deliver complete sonic clarity to the entire hall. Unfortunately, the auditorium’s low ceilings posed a problem. Such ceilings resulted in a smaller coverage for each speaker and typically required a greater number of speakers to ensure a uniform sound. The longest running and most established networking tradeshow on Pro Audio, Light, Music & Technology returns on the 1st - 4th September at the China International Exhibition Centre, OLD (CIEC); bringing you a whole new level of experience during the 3 and ½ days event. PALM Expo will open her door from 9.00am to 5.00pm daily from the 1st to 3rd September and on the last day (4th September) will end by 12:00 noon with last admission at 11:00am. This year marks the 25th Anniversary of PALM Expo and the organizing committee together with the invited guests; will be commemorating this memorable milestone with a big bang during the tradeshow. An estimated number of over 1650 guests will be invited to the celebration dinner; with selected high-end brands in the industry putting up a Lighting and Audio show at the dinner; specially choreographed by the renowned Lighting Designer, Mr. Sha Xiao Lan and his team. The above sectors have been earmarked as future growth segments in the next few years with abundant of business opportunities waiting for industry players to capitalize. Occupying a total exhibition space of 40, 000 m² with more than 600 exhibiting companies from over 20 countries and regions, PALM Expo 2016 continues to play host to the industry leading brands both local and international alike. Perennial favorites like Allen & Heath, Christie, dnp, Extron, JBL, d&b audiotechnik, Electronic Threatre Control, High End Systems, ART, Avolites, Coef, EAW, RCF, Running man, Powersoft, Wharfedale, KE Audio, KS Audio, Meyer sound, LAX, Sennheiser, Beyerdynamic and Yamaha, SBS, Antari Lighting, Columbus Mckinnon, Montarbo, Wolf Vision and Beta 3 etc, to name just a few, will be displaying their latest products and technologies at the show floors. Another highlight at PALM Expo; the annual Log on to our website for more detailsstabout these conference will be taking place on 31 August at brands at PALM Expo. the Radisson Blu Hotel Ballroom and the main focus of this year conference theme is on Application of New technology at Performing art venues. International speakers from America and Germany will be speaking and highlight the latest insights on performance art venues technology during the conference, in addition to local industry expert from China Attendees to the event is BY INVITATION ONLY! Over 200 representatives from the following sectors: performing arts venue, theater groups, architectural firms, cultural and creative companies, designers of entertainment equipment institutions and enterprises, technical application personnel and related art research, professional institutions students and teachers, have confirmed their attendance and this year delegates have a better mix from various countries such as United States, Germany, Brazil, South Korea, Japan, China and ten other countries to-date. UP-TO-DATE NEWS ON ‘BUDDING’ SECTORS Recent market research revealed upon reaching a new height in China’s economy, Beijing - city well known for her rich Culture and Art market went uphill. The industry was measured 279.43 billion worth in 2014, a jump by 8.4 percent compared to 2013. From statistics shown, the Academy in Arts grew more than 10 music conservations and over 50 universities offered Art degree, professional troupes and performance groups expanded to 90 numbers, thousands of training institution in Music, over 300 qualities and 120 above standard performance venues that fetched a total revenue of CNY ¥ 1.5 billion – topped record in box office with 295 stages and sitting 10.1 million in 2014. Facilities without exception is segregated into 20 public arts and centers, 300 stations broadcasted approximately 30,000 events welcoming more than 6 million visitors annually. Besides, Beijing hold over 150 cinemas and 800 screens knowing China is the second largest film market worldwide. As of 2020, 20 culture and creative industry zones in threatre play, music world, film and television production shall be planned and constructed, expanding its development in Beijing as China’s hub of culture and crossing of countries for publicity to widen business opportunities. ROI RESULTS IMPACT FROM DISCUSSION HOW CAN IT BE APPLIED? To encourage continual learning and enhance visitors experience, PALM Expo has collaborated with exhibiting companies to provide free technical seminars on new products and products workshop for trade visitors at the General Service Building. WHAT INFORMATION IS ABSORBED? HOW PARTICIPANTS REACT? To-date over 20 sessions has been confirmed and further details will be made available nearer to show dates. For another spectacular PALM EXPO 2016! PALM EXPO is jointly organised by Informa Global Exhibitions and the China Entertainment Technology Association (CETA), exclusive social organization in Ministry of Culture, People’s Republic of China, and authorized representative under the entertainment solutions of China, guiding the economy and technical evolution in related trade. Video Projection Closeups TDC relished the huge logistical challenge of coordinating nine sites: •	70 video projectors, from 40,000 lumens through to 22,000 lumens. •	Over 30 technical staff employed full time. •	11 kilometers of projection. •	20 million pixels equivalent to over 60 IMAX screens. •	20 kilometers of signal and power cables. •	22 media servers. •	3 different automation platforms servers running on unique software code. •	All sites remotely monitored with realtime remote reporting. •	A total light output of 1,750,000 ANSI lumens brightness. •	Ensuring energy efficiency, equipment is powered every night but on-standby during the day. •	Impressive 800GB video footage being played back continuously. X-Factory, Central Park Sydney The façade of Sydney’s first brewery, Carlton & United Brewery, was once again given a dramatic makeover by TDC. “We’ provided projection technology and mapping to a building that is roughly 45 by 30 meters,” enthusiastically explained Anthony Pellizzari, enjoying being back at this site for 2016. Nicholas Tory, director at Ample projects said: “Our 3D content showcased the great shift from human labour to computation in the dynamic factory from how it once was, to exploring how technology is changing the Factory as a human workplace. We worked with video masters, TDC, to pinpoint the exact locations and coverage for our content.” Ample Projects also worked in conjunction with a group of University of Technology students who produced over 30 minutes of additional content for the Central Park precinct. Taronga Zoo For the first time, Vivid Sydney incorporated Taronga Zoo Centenary Celebrations. 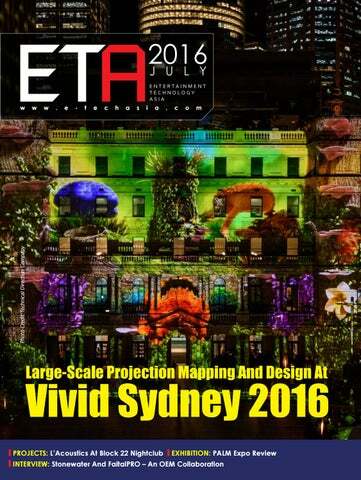 Visitors were welcomed by a grand projection onto the façade of Taronga’s heritage listed main entrance building. Ample Projects eight-minute long projection show and 3D mapping had been created by its multi-award winning artists and the projection technology and mapping provided by TDC. PROJECT HIGHLIGHTS Laser-Dragon Water Theatre TDC provided video projection onto three water-screens that were mounted on a 13m robotic arm floating high above 56 fountains, arranged in snake-like coils. The moving water screen can take the shape of a fearsome dragon or any of the characters taken from Commedia Dell’Arte’s 16th century theatre. Steve Cain said: “I really love the colour and vibrancy of this installation. The challenges for this site are multiple angles, trees, and returns, which we’ve managed to map accurately. This is a stunning building to project onto which is a light coloured sandstone. The shape is really interesting for projection too. In line with Vivid Sydney, the Taronga Zoo, was lit up with a trail of giant animal multimedia light sculptures. The project was created by Ample Projects, with interactive lighting, sound effects and moving parts. The sculptures were presented with a great technologically advanced setup – the tender was won by Mandylights who created a colourful and atmospheric setting for the sculptures. “The zoo is basically pitch black at night and in many areas we really had to start from scratch,” commented Richard Neville of Mandylights. “There were some areas where we had complete free reign and others where we were complementing the lanterns.” Crucial to the lighting design were 130 x ShowPro Hex 18 LED PARs and 24 x ShowPro EX36 LED Floods, both of which have an IP65 rating. The PARS provide a solid base of colour for the entire site onto which Mandylights layered more lighting. town of Chuncheon and its Song-Am Sports Complex. This year’s bill included Blasterjaxx, Tomswon, Julian Jordan and KSHMR. In 2016, an important liaison was made with influential EDM producers Q Dance from Holland (Qlimax, Defqon, Tomorrowland) who collaborated on this year’s festival. Q Dance brought its hallmarks of dynamic staging, pyro and impressive sound/lighting to the stadium, as well as two well-known DJs from its stable, Atmozfear and Noisecontroller. Leading sound rental company Way Audio handles the PA requirement for the World DJ Festival, the only production supplier to keep its contract for the full ten years. As the event has grown, so too have the PA designs. Way Audio was an early pioneer of NEXO’s STM modular line array systems, which have proved ideal for the EDM material and stadium location of the SWDF. of STM, each built with 3 x STM M28 compact modules on top of a S118 sub. Often informally referred to as “Texas headphones”, these ground-stacks are supplemented by NEXO PS15s. The entire PA system is powered by NEXO’s Universal Amp Racks (11 x NUARs), each containing two NXAMP4x4 amplifiers. This year, Way Audio implemented one of the largest STM system configurations, using arrays of 21 x STM M46 main plus B112 bass cabinets, delivering high SPL coverage over the wide audience area. 21 x STM S118 subs, groundstacked on each side, were boosted by another 12 x CD18 subs in front of the centre stage, to provide “a goose bumps performance”, according to James Lee of A-Works, the NEXO distributor and support centre in Korea. For James Lee, the best victory of the show was in the verdict of the Q Dance team, currently on a world tour and using NEXO STM for the first time. “The Q Dance team usually get the system they ask for on their rider, and were a bit suspicious when they saw NEXO STM for the first time. But the show was such a success, they gave it the thumbs-up!” The crowd certainly approved - according to James, hardly anyone left the sound field for 3 hours, not even for a toilet-break! ne of the most anticipated runs in Singapore, The Music Run combines music and sports in one fun event. Held in April and organized by AIA, the event drew wide attention from music and sport enthusiasts around Singapore. The Music Run was designed to encourage participants to live a healthy life with the help of music as a source of motivation. Furthermore, organizers engaged with the participants by giving them the privilege to vote for the songs that will be played at the event. Hilltop Hoods Wows Audiences Across Australia Lighting Designer Paul Owen creates dynamic stage lighting effects with his trusted Avolites console own movement effects, exactly as I wanted them. I used the function to create offset zoom effects, colour effects and offset gobo spin effects to name but a few! Any little nuance in a layer I could think of, Key Frame Shapes was the answer. It's an easy-to-use yet powerful function. The number of main playbacks on the Sapphire Touch also came in useful."